Romeo BLE Quad is an arduino compatible robot controller based on STM32 ARM chip. It inherits all features from the Bluno M3, including wireless programming support, wireless communication between iOS/Android apps and remote control. Beyond this it also includes a 4-way DC motor driver and encoder interfaces. You can implement a robot with PID closed-loop feedback control directly with our TT Geared Motor. As well as this the Romeo BLE Quad offers powerful performance thanks to the STM32 ARM 32-bit microcontroller with more storage space and more interface resources. 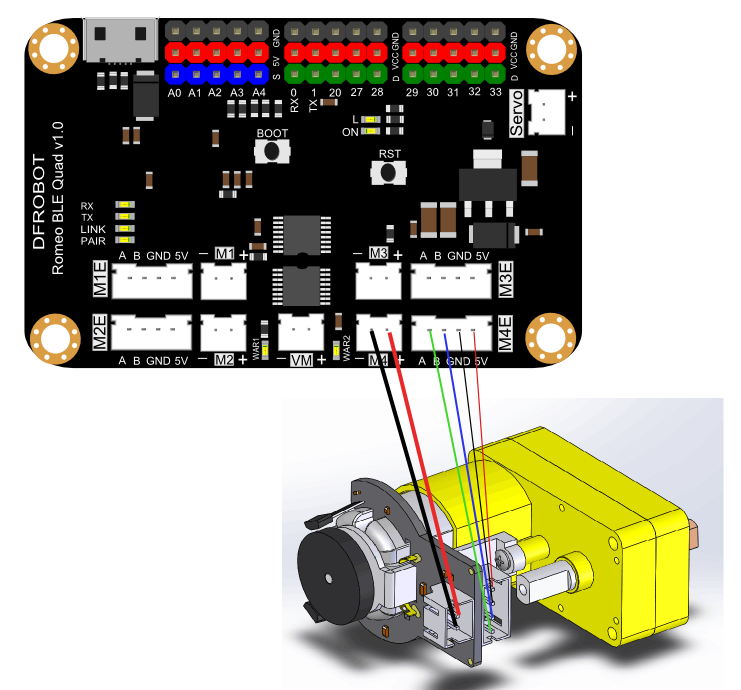 DFRobot has developed bespoke firmware to make it compatible with Arduino IDE and accessible to beginners to robotics. 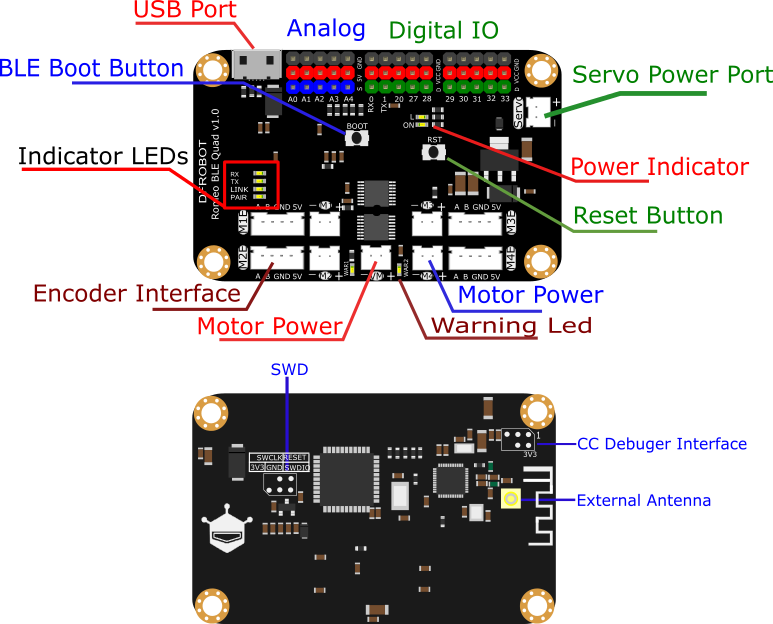 Note: The operating voltage of Romeo BLE Quad is 3.3V, please read the Board Overview carefully before usage! NOTE: Romeo BLE Quad serial port starts from Serial1, it is in charge of USB & Bluetooth communication. 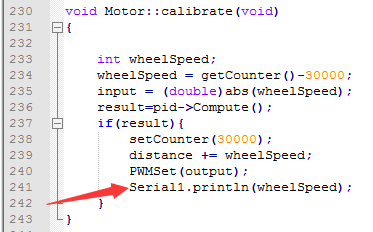 You need to change Serial to ‘’‘Serial1’‘’ in the sketch if you want to use serial monitor. Special Attention: The operating voltage of Romeo BLE Quad is 3.3V, only some of pins support 5V input, please read the following instruction carefully before usage! Or it will destroy the micro chip. Most of function has been encapsulated in the library, you can modify the output content in "Motor.cpp", line 241. Motor speed runs with expected speed. 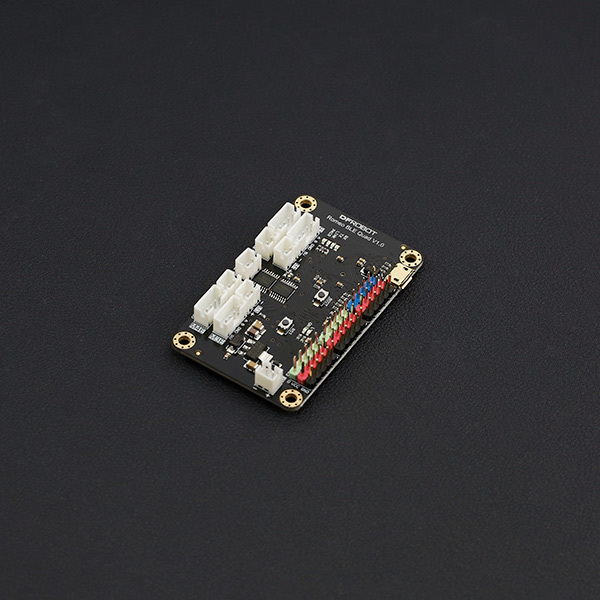 Get Romeo BLE Quad Robot Controller SKU:DFR0398 from DFRobot Store or DFRobot Distributor.